Jambo Everyone: Take a Spin on Triceratops Spin! Below is a short review of the Triceratops Spin by Discoverer Meghan, Jambo Everyone's soon-to-be-nine-years-old contributing writer. Meg might be young, but she is already a seasoned veteran of Disney's Animal Kingdom. If you have a 2 to 6 year old child you might want to bring your kid on Triceratops Spin! You get a great view of Dinosaur Land. If your kid is afraid of heights, they have a lever in the front seat so you can control the height you fly. And here's the fun part, you can use the lever to fly however you want. You don't have to wait that long on the line. 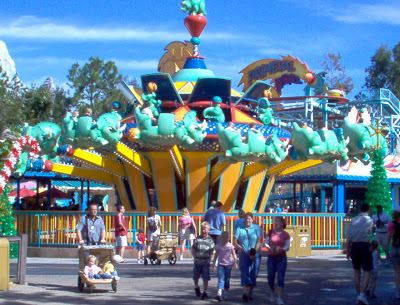 Triceratops Spin is a fun and great ride for children of young ages.